Waiting for a barge to cross. Note sign on piling at bottom of picture. 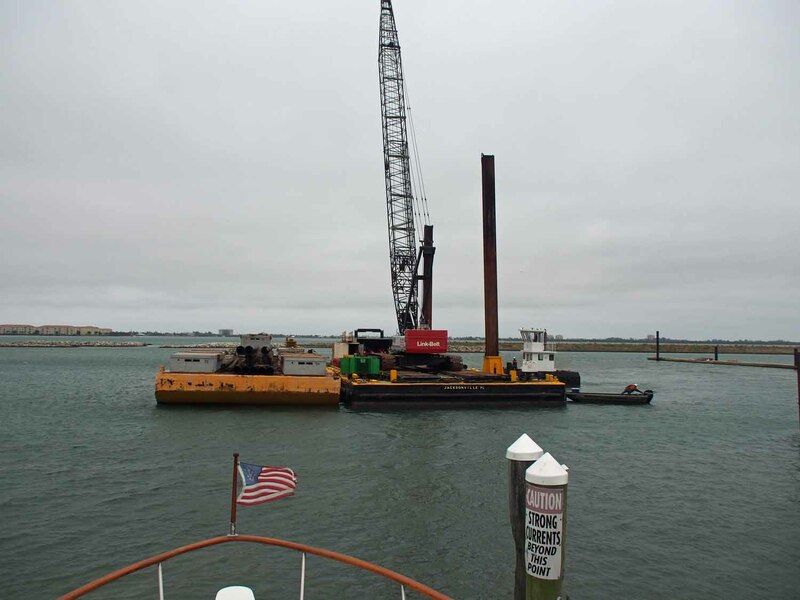 After pumping out and toping off our fuel at the Fort Pierce City Marina we just left the dock and had to stop, back up and retie as a construction barge for the new docks came in front of us. Once that was out of the way we took the scary channel out to the ICW. The channel isn’t so bad if you’re ready for it. It can have a very strong sideways current (the guy at the marina said up to 5 knots, but I think that’s stretching it a bit) that is OK if you’re ready for it. We’re told that some are not and get a good bash on the pilings or are swept out of the channel to run aground. I had heard about this before we came here but coming in was still surprised by the current’s strength and got closer to one down current piling than I should have. I was better prepared going out and had no problem. The day was rainy and a bit windy. 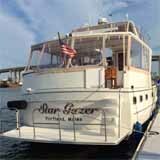 Had we been going on the open ocean or great lakes we would have waited, but with Adam and his family coming soon as well as a few boat service people this was one of the few times we wanted to make schedule. It was grey with just a touch of light rain a few times. Dreary but not miserable. Up to now we’ve had as many as 4 drawbridges on one trip. Today we had 11. Our air draft with the big antennas down (but usable) is 20’, so I’ll go under anything 21’ or higher. All but 2 of these bridges we could clear without opening. Those 2 had schedules, one hourly and one every half hour. With slowing down for boats in the water and passing marinas it’s hard to plan for the time of arrival at a scheduled bridge, but we were fortunate today to have waits of a few minutes at each one. We’re at Lantana now, but the weather is still rainy and really windy. That cold front affecting the entire country is making it colder than usual here also. I’ll wait a few days to get some pictures before publishing this.